These are handwritten and typed letters by Sigmund Freud, the Austrian psychoanalyst. Main correspondents include Emil Oberholzer, Dr. T. Schnierer, and Karl Menninger, among others. These letters are written in German and English and some translations are included. 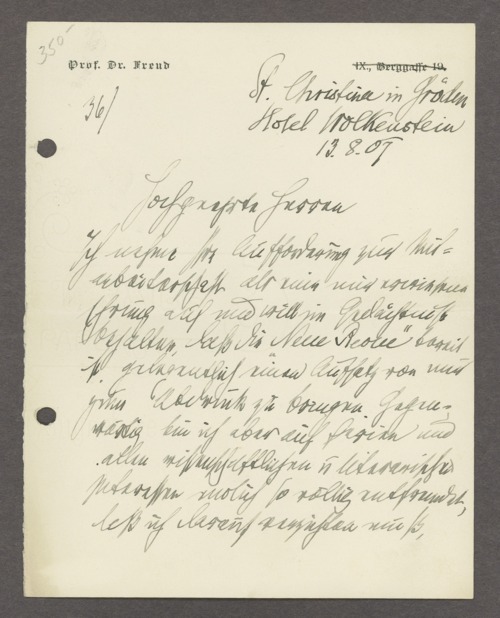 Correspondence relating to Freud's departure from Vienna in 1938 is also included. Material not made available online includes articles and publications under copyright about Freud and his work. These letters are part of the historic psychiatry material in the Menninger Archives. Many of the items in this portion of the Menninger Archives were purchased.